I made a rather large error in my post last Friday about home runs. 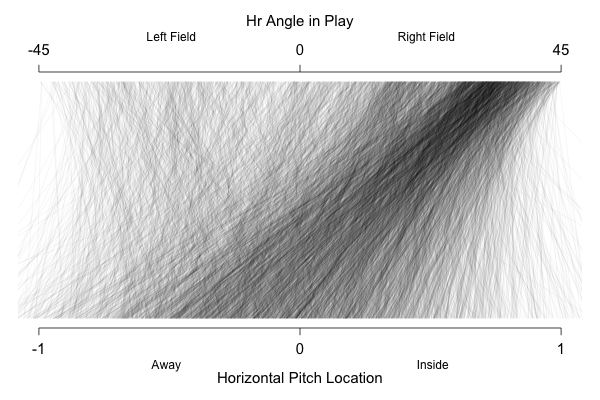 The error was in the last two figures that showed the relationship between the horizontal location of a pitch and the horizontal angle in play of the resulting HR. This error led to an incorrect conclusion. Here is what the graph should look like for RHBs. I want to thank Mike Fast who pointed out the problem to me and also apologize to the readership here at Baseball Analysts for this error. I have edited the original post with the correct graphs and text. It would be nice to see this as a probability distribution. 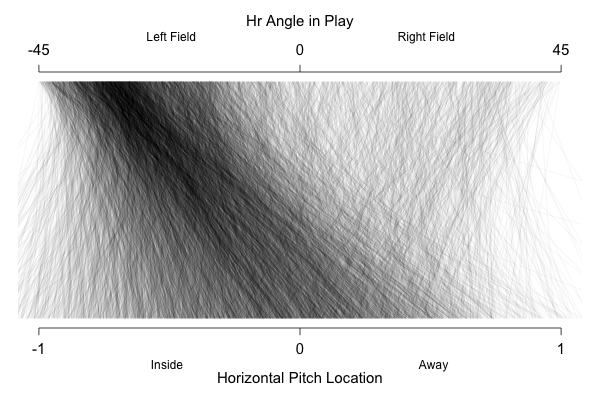 On the X axis you could have the horizontal pitch location, and along the Y axis you could have the vertical pitch location. The Z axis would be the relative frequency of hits at each (X,Y) pair. As it is, the huge effect of pull hitting is obvious, but there may be other effects hiding in there that are more difficult to see.